The American Heart Association (AHA) and American Red Cross (ARC) has established up-to-date educational course materials to provide comprehension and competency in all AHA and ARC programs, products and services. The information contained in this Palm Desert Resuscitation Education (PDRE) Web site and classroom-based or online courses is not a substitute for medical advice or treatment, and the PDRE, AHA, and ARC recommend consultation with your doctor or health care professional. 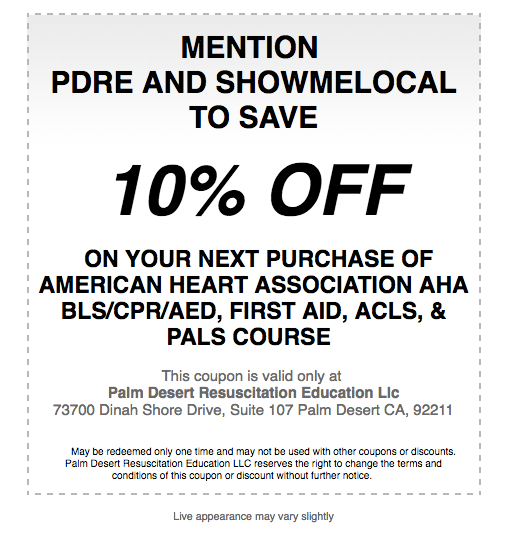 The use of these instructional content and information by the Palm Desert Resuscitation Education (PDRE) do not represent course sponsorship(s) by the AHA, ARC and PDRE’s other affiliations, partners, and friends. Any payments, expenses, or compensation charged for AHA and ARC programs, products and services, excluding a portion of fees required for AHA and ARC educational course materials, do not represent income to the AHA and ARC. 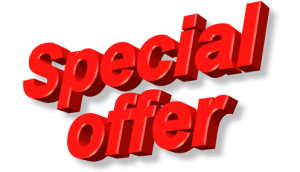 All prices and/or schedules of AHA and ARC programs, products, and services offered by PDRE are subject to change without notice. However, we cannot control price increases by our suppliers. While PDRE works to ensure that product information is correct, on occasion manufacturers may alter their product component lists. Actual product packaging and materials may contain more and/or different information than that shown on our PDRE website. We recommend that you do not solely rely on the information presented and that you always read labels, warnings, and directions before using a product sold by PDRE. For additional information about a product, please contact the manufacturer directly. PDRE assumes no liability for inaccuracies or misstatements about products. Before you purchase an AED sold by PDRE, please note that PDRE assumes no liability for the use of the AED after it is purchased as is, which include situations when the AED malfunctions due to manufacturer marksmanships or product deficiencies. To learn about state requirements for using or owning a home defibrillator, contact your state health department. You cannot use the AED to treat yourself. You may use the HeartStart Home Defibrillator on a person with a pacemaker or ICD, but do no place the pads directly over the implant. The HeartStart Home is approved for use on adults and children over eight years old. SMART Pads cartridges, for use on children under eight (prescription required), are sold separately and purchased through the Manufacturer. Users may need to perform CPR. Responding to cardiac arrest may require you to kneel. Voice instructions and enclosed materials are in English. HeartStart Home Defibrillator provides audible and visible indicators when maintenance is required. No claims, representations or warranties, whether expressed or implied, are made by PDRE as to the safety, reliability, durability and performance of any of our companies’ programs, products, and services. Furthermore, our company accepts no liability whatsoever for the safety, reliability, durability and performance of any of our companies’ programs, products, and services. 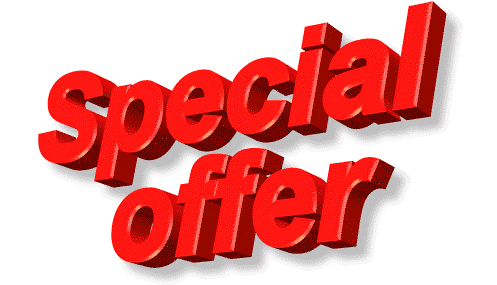 Therefore, as a customer, you understand that in no event shall PDRE be liable for any direct, indirect, punitive, incidental, special consequential damages, to property or life, whatsoever arising out of or connected with the use or misuse of our programs, products, and services. We urge our customers to understand that the medical content on this site is for reference purposes only and is not intended to substitute for advice given by a physician, pharmacist, or other licensed health-care professional. You should not use this information as self-diagnosis or for treating a health problem or disease. Contact your health-care provider immediately if you suspect that you have an existing medical problem/condition or if you have any concerns about your health. Information and statements by the PDRE Web site are not intended to diagnose, treat, cure, or prevent any disease or health condition. The following information should not be mistaken as legal advice and PDRE makes no representations or warranties to the accuracy of the AED law or regulation information provided. AED Laws are changed and updated frequently. We recommend that you contact your state health department for the most up to date AED law information. If you find an error or have an updated AED law or AED statute, please contact us and we’ll update our website right away. Any individual who is trained to use an AED and who uses one in good faith in an emergency will not be liable for any civil damages. A person who provides CPR and AED training to a person who renders emergency care is not liable for any civil damages. A physician who is involved with the placement of an AED and any person or entity responsible for the site where an AED is located is not liable for any civil damages resulting from any acts or omissions of a person who renders emergency care in good faith. The provisions of this bill do not apply in the case of personal injury or wrongful death that results from the gross negligence or willful misconduct of the person who renders emergency care or treatment by the use of an AED. Assembly Bill 254 (2005) (Amended in 2006) AB 254 was only in effect until January 1, 2008. AB 2083 extended the provisions of this bill to January 1, 2013. Be maintained and regularly tested according to the operation and maintenance guidelines set forth by the manufacturer, the American Heart Association and the American Red Cross. Be checked for readiness after each use and at least once every 30 days if the AED has not been used in the preceding 30 days. Any person who renders emergency care or treatment to a person in cardiac arrest by using an AED must activate the emergency medical services system as soon as possible and report use of the AED to the local physician and EMS agency. For every AED unit acquired up to five units, no less than one employee per AED unit shall complete a training course in cardiopulmonary resuscitation and AED use that complies with the regulations adopted by the Emergency Medical Service Authority, American Heart Association, and American Red Cross. After the first five AED units are acquired, for each additional five AED units acquired one employee shall be trained beginning with the first AED unit acquired. There must be a written plan describing the procedures to be followed in the event of an emergency that may involve the use of an AED. After AED placement in the school, the principal must ensure that school administrators and staff annually receive a brochure (approved by the American Heart Association and American Red Cross) that properly describes the use of an AED. The principal must, at least annually, notify school employees as to the location of all AED units on the campus. The principal must designate the trained employees who shall be available to respond to an emergency that may involve the use of an AED during normal operating hours. SB 911 – added exemption from liability. AB 2041 changes liability provisions.